Corazón, a non-profit organization, hosts programs to bring neighbors together into a larger community, inspiring relationships across physical, linguistic, economic and cultural borders, thus making both communities better. Building a spirit of teamwork and confidence among the volunteers from both sides of the border. We learn to work together, rely on each other, learn and use new skills, while also understanding the true spirit of service and the satisfaction of accomplishing work that is beneficial to others. The shared experience and adventure provides a strong sense of accomplishment for our Church community and of the self-reliance and empowerment in the Mexican families and communities. 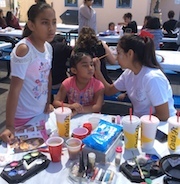 El Campo Del Sol is a fun-filled day, traditionally in August, of games, art, food, raffles and music for 150 economically disadvantaged children & teens who live in the Carpinteria and Santa Barbara area. During this event, the students will receive backpacks filled with school supplies. Students are also able to choose a school outfit from our gently used clothing. Each year, Our Lady of Mount Carmel Parish holds Santa's Workshop on the first weekend of December. In the month of November, we begin collecting gently used toys. We decorate the Parish Hall to create "Santa's Workshop". We then paint, repair, wrap and tag the toys. Parents are encouraged to ask their teens to join this fun and valuable project. Our workshop is from 6:00 pm to 8:00 pm. We enjoy Christmas music, pizza and refreshments. We hope everyone will join! Santa's Workshop is an exciting project that creates fun and fellowship, and it brings a special meaning to the volunteers as well as those who receive the gifts. We all learn through example, and our hope is that you will join with your children in participating in the Giving Tree. Since Christmas is a time of giving and sharing, we are inviting our parishioners, including children, to join us in helping some of the less fortunate families in the Santa Barbara and Carpinteria communities experience the joyful love of Christmas. The Giving Tree is a ministry where we, with the assistance of parishioners provide newly purchased gifts for youth who are economically disadvantaged in the Santa Barbara & Carpinteria areas. We coordinate this project with various services including Santa Barbara Catholic Charities and People’s Self Help Housing to ensure that the needy are fairly represented in receiving gifts. Hundreds of children and entire families experience the joy of receiving gifts, and our parishioners participate every year as they experience the joy of giving gifts to local residents. In addition to our individual children, we are looking for parishioners to sponsor a family. We have many different size families available. Remember that there is a 2 gift limit per child. 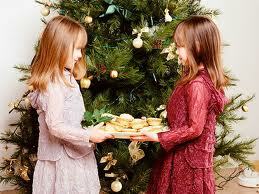 This helps us to ensure that all the family gifts are delivered together. Our Lady of Mount Carmel hosts an annual Christmas dinner for the mothers and children living at St. Vincent's. Volunteers create a festive, wrapped family basket with a monetary limit of $40. Suggested basket items are: lotion, make-up, warm socks, movie tickets, chocolate, and a gift of clothes/toys for the child. On average, 60% of clients return to permanent housing with the economic means to sustain it. Since its beginnings, over 10,000 parents and their children have been directly helped by Transition House. The success of Transition House is also achieved because of two groups—the residents of our community who provide over 70% of our annual operating expenses, and volunteers who provide in-kind services valued at over $350,000 each year. Collectively, 1,200 community members support the work of staff at Transition House. For over 25 years Transition House has worked with numerous groups and community members who have volunteered their resources, time, and skills. Check out our current 35 dinner groups who provide warm meals for our clients 365 days a year. Thank you all from the bottom of our hearts. Our Lady of Mount Carmel Parish provides dinner the first Friday of every month. Our Parish coordinators are by Alvin and Rina Bentajado. Please contact the Parish Office if you are interested in helping. The Community of Churches in Montecito – M4, is the name given to the four Churches of Montecito's joint worship and outreach. This group consists of Our Lady of Mount Carmel, All Saints by the Sea, El Montecito Presbyterian Church, and Montecito Covenant. Together we participate in joint ecumenical projects collectively chosen to benefit various local community and global needs. We have raised money to provide clean water wells in Ethiopia, fill backpacks with school supplies for local, economically disadvantaged children, assembled AIDS caregiver kits, which were sent to Africa, helped to "spruce up" Cleveland School, and most recently participated in the "Hike for Haiti" which set out to raise money for Destined for Grace, a local non-profit organization with the mission to bring educational opportunities to children in Haiti.